Proving once again that he doesn’t give a hoot about America, and only cares about the Democratic Party, on Tuesday, Senate Minority Leader Chuck Schumer, D-N.Y., announced his party will oppose any legislative effort to stop children from being separated from their families who are attempting to cross the southern U.S. border illegally. That opposition includes a thinly directed bill that only prevents the separation. 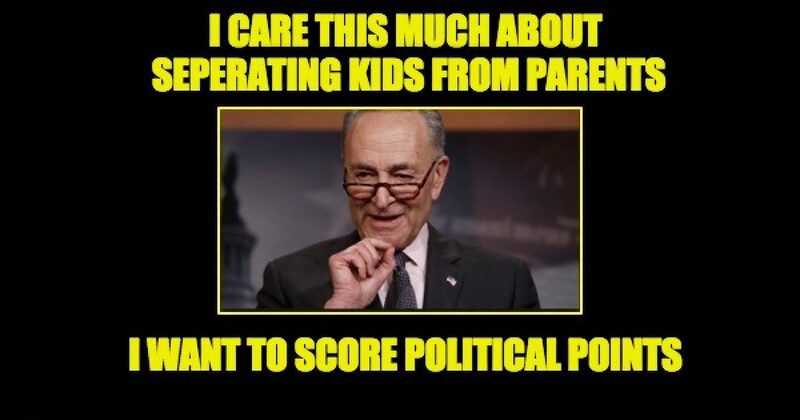 In other words, he doesn’t give a damn about the kids –all he cares about is scoring political points. Majority Leader Mitch McConnell said he was going to offer up a bill to keep immigrant families together while seeking asylum on the U.S. border, Schumer said they want to keep the focus on Trump. Poison pill? Maybe if Chuck Schumer pushed his glasses all the way up to his nose, he would be able to read what’s in a piece of legislation. What Schumer is really trying to do is end Trump’s policy of enforcing the law. He won’t allow a fix unless the POTUS backs down and reverses his “zero tolerance” policy and allows open borders. But this president doesn’t believe in changing immigration law by executive fiat as Obama did. His job is to implement the law not to legislate. Congress needs to fix the problem legislatively. First, we need to amend the 2008 Trafficking Victims Prevention Reauthorization Act, or TVPR — which is much easier to say. This law encourages families to put children in the hands of smugglers to bring them alone on this dangerous trek northward. And make no mistake, we’ve talked about this before — this trek is dangerous and deadly. I would suggest to those protesters fighting for the rights of the kids in detention centers to direct their protests to the man who wants to score political points instead of helping the illegal immigrant children—New York Senator Chuck Schumer. Come on Chuckie, how do you sleep at night?